This week’s edition of EatDrinkFilms is focused on the Philippines. I’ve had good Filipino food, but have never really cooked much of it. Amy Besa and Romy Dorotan’s book Memories of Philippine Kitchens is an amazing and invaluable guide to the ingredients, history, and techniques of cooking from these islands that are a true melting pot of world cuisine. They used to have Cendrillion restaurant in Manhattan’s Soho neighborhood and now run The Purple Yam Restaurant in Brooklyn’s Ditmas Park. I also have some great Royal Apricots from the market. The Royals and Blenheims (and Royal Blenheims!) are just coming in and they are the best. They have a short season and don’t travel well so they’re pretty much only available at farmers markets. Guru Ram Dass Orchards has some of the very best. So this is how a recipe happens—I have a theme and an ingredient—now what to make? 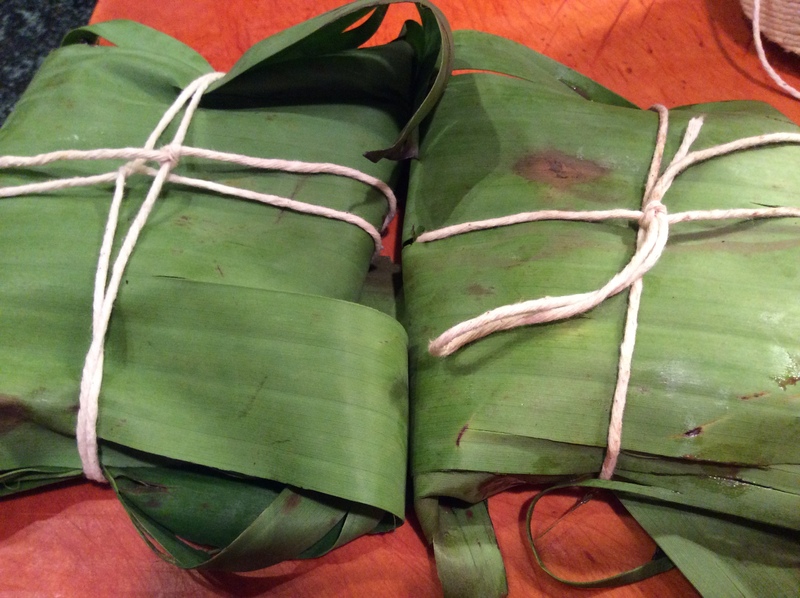 Amy and Romy have a really interesting recipe for Filipino tamales wrapped in banana leaves and using soaked ground rice instead of masa for the filing. Their recipe calls for chicken for a savory tamale (in Mexico the singular is referred to as a tamal but in the Philippines they are always called tamales). With the apricots in season, dessert seems better. 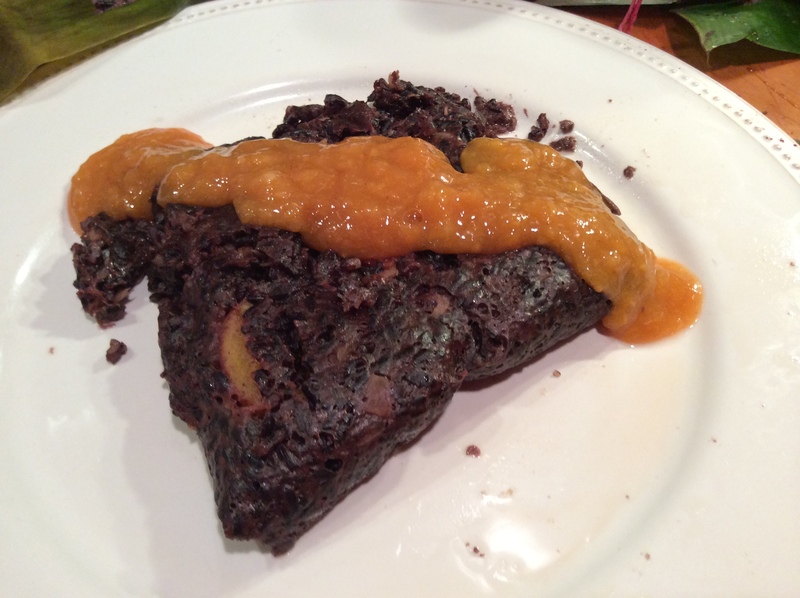 I’ve got a great recipe for black rice pudding. What if I put the pudding in banana leaves, add some apricots and steam it? That sounds good. Melt the butter in a two quart pot and when melted add all the ingredients for the filling, bring to a boil, cover, reduce heat to low, and cook for 45 minutes. You might want to check after 30 minutes and make sure you still have some liquid in the pot. If it looks dry, add some more water. After 45 minutes remove from heat and put rice into a bowl and let cool a bit. It should be a lovely purplish color. Taste it now and see if it’s sweet enough. When it’s cool enough to touch comfortably, stir in the egg yolks and mix well with a spatula. Mix in the pickled ginger if you’re using it. Wipe the banana leaves with a damp paper towel and place one of the large squares on the counter. Put one of the small squares in the center and place a fair-sized scoopful on the small square. Push four apricot halves into the rice. Fold the larger square over the filing and tie with kitchen twine. Have a pot with a steamer basket and some water boiling and put the wrapped tamales in the basket and steam for 20 minutes. While the tamales are steaming (or really anytime you think of it) make the sauce. Pit the apricots, put them in a food processor and let it fly. Taste. Add some lime juice. Start with the juice of half a lime, blend again and taste. Does it need more? Is it sweet enough for you (remembering that the rice pudding is pretty sweet on its own). Add something sweet—brown sugar, white sugar, or whatever you used for the filling. Add it a bit at a time and taste again. Do you like it? When the tamales have steamed, unwrap them put them on a plate and top with sauce. Or maybe some mascarpone or whipped cream would be nice. Or ice cream. I’ve received some nice feedback from readers. I’ve also been asked some good questions about substitutions for, shall we say, the more esoteric ingredients (I’m looking at you, vanilla palm syrup and preserved lemons). I’ll try to address those issue here in future columns. You can get a big bag of banana leaves at the Berkeley Bowl for three bucks. I mean ten huge leaves. If you don’t have this option or don’t feel like deforesting the banana plantations for just one or two leaves, you can wrap the tamales in corn husks, as in a true tamal, or you can use parchment paper. Plastic wrap will work too. You could butter some ramekins, fill with rice and cover with plastic wrap and steam. Or just put in a buttered dish and bake in the oven. I don’t use any spices in this but that doesn’t mean you can’t. Cinnamon, lemongrass, nutmeg, or cardamom all might work. Don’t have apricots? Use mango, pineapple, or another fruit. 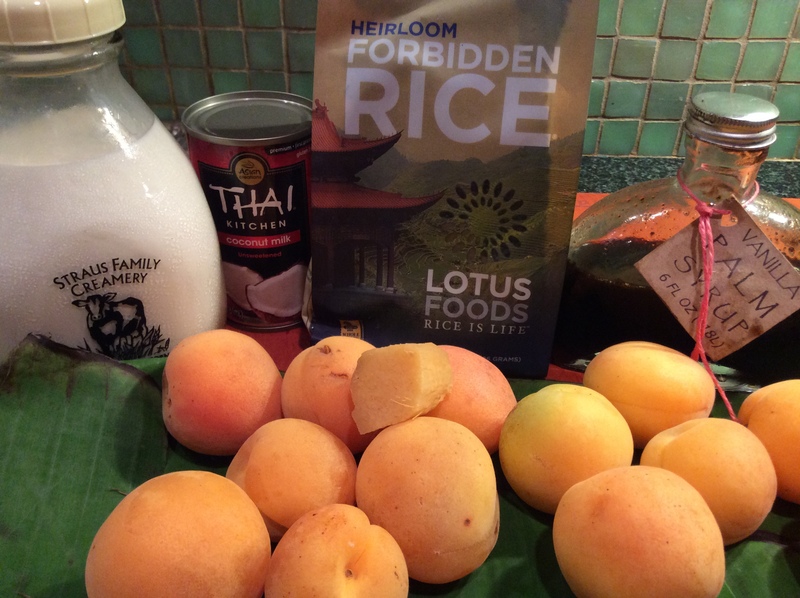 For this recipe I use Forbidden rice which is a short-grain rice originally grown in China, but you could substitute any variety you like. Thai black rice, white rice, brown rice, or red rice all would work though you’d want to vary the cooking times to make sure you had a nice soft mush or rice. My ultimate goal is to get you to have some fun in the kitchen and not feel that you’re always tied to a specific ingredient or technique. 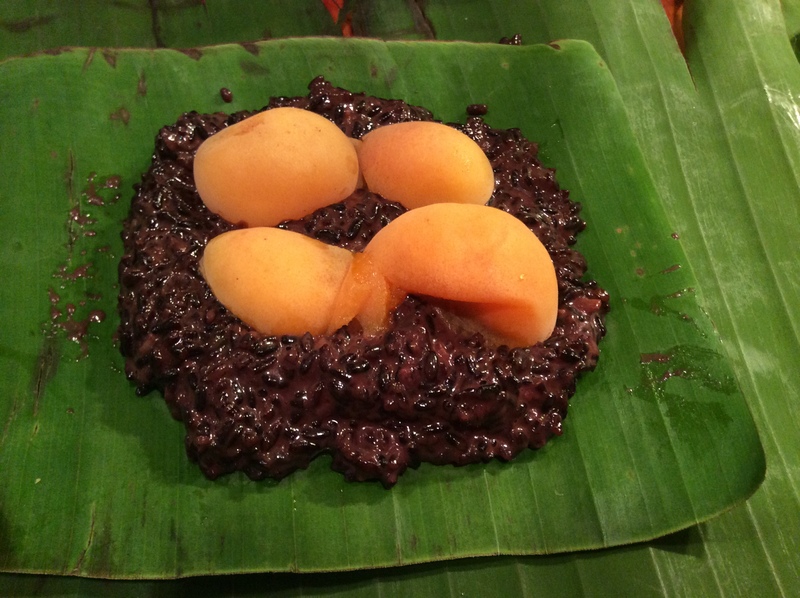 This entry was posted in Eat and tagged apricot, banana leaves, black rice, coconut, dessert, Eat, recipe, rice pudding, The Secret Restaurant. Bookmark the permalink.